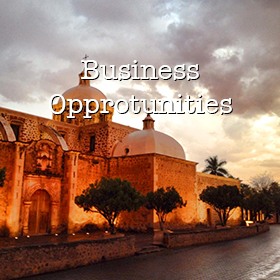 When investing in Alamos, you are investing in a lifestyle that delights the senses. 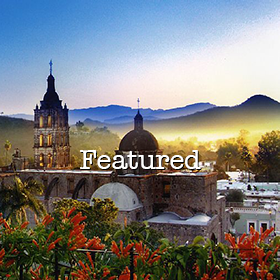 Located in the foothills of the Sierra Madre, Alamos was once the most important colonial city in northern Mexico. Silver was discovered by the Spaniards during the 1600s and over the next 250 years, it became a center of government and culture. As the mines played out in the early 20th century, Alamos nearly became a ghost town. Discovered again in the 1950s by Americans and Canadians, Alamos began to come back to life as many of the formerly resplendent, adobe homes were restored. Today, it is a town of about 15,000 inhabitants, with a foreign community of about 250 households. The colonial, magical setting has made this village irresistible to many and the second most popular of the "Pueblos Magico" of Mexico. Alamos homes are famous for their architecture and gracious style. Arched portales, 20-foot ceiling spans and thick adobe walls, carved niches and conchas, wrought iron grills on doors and windows, and inviting interior courtyards filled with flowers and fountains are just a few of the common building elements throughout Alamos. Residential properties range in price from US$20,000 to US$1,000,000. 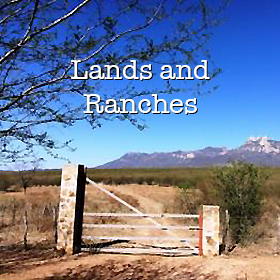 Unlike coastal and borderland properties, urban and rural lands in and around Alamos may be owned directly by a foreigner. Foreigners may obtain direct ownership of property in the interior of Mexico. But, under Mexican law, foreigners cannot acquire direct ownership of residential property within the area 100 kilometers from the border and 50 kilometers from the coastline. These areas are known as the restricted zone. It is possible, however, to acquire beneficial rights to use, improve, and enjoy property in the restricted zone through a Bank Trust or Fideicomiso authorized by the Mexican Government under the Ministry of Foreign Affairs. The Fideicomiso is established for a 50 year renewable term and grants the beneficiary the right to use, rent, modify, or sell the property. An advantage of the bank trust is the avoidance of probate upon the death of the beneficiary when a substitute is named. Property acquired for commercial use by foreigners may be owned without the need for a bank trust, provided that the property is held in a Mexican corporation. Depending on the type of business, it is often possible for a foreigner to own 100% of the Mexican corporation. Should you decide to own property in your own name, a deed called an Escritura, must be issued by a Mexican notary public or Notario Publico. In some states in Mexico, it is now possible to name beneficiaries in the deed but, if this not the case it is advised to a have a Mexican Will prepared to avoid expensive legal fees to probate at the time of death. In Mexico, the notary public or Notario Publico is a public official with a law degree appointed by the State Governor with the capacity to attest and certify documents and business and legal transactions that require authenticity. The Notario Publico also provides for strict security of original records and documents. Every legal document, such as deeds, wills, power of attorney, constitution of corporations, establishment of trusts and other legal transactions must be made before the Notario Publico, in order to be valid. If the document is not notarized by the Notario Publico, it is not legal. In a typical transaction, a preliminary sales purchase agreement will be used. This will serve to outline the terms of the sale and is subject to a formal agreement which is executed at closing by the Notario Publico. The preliminary agreement should provide for a price and terms -- generally, purchases are on a cash basis as bank loans to foreign investors are difficult and costly -- and a closing date conditioned on the issuance of the trust permit, if necessary. Escrow as it is known in the United States is not used in Mexico, and real estate transactions are not regulated as they are in the United States, so use your discretion as to how these funds are held until closing. A lawyer is not necessary when acquiring real estate in Mexico as the Notario Publico is completely capable and legally authorized to carry out the transaction. As with any investment, you may want to seek counsel in order to investigate all options and work with a reliable real estate office. 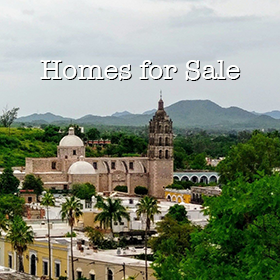 In the State of Sonora, real estate agents must be registered and licensed with the Secretaria de Economia del Estado de Sonora. Your real estate agent can assist you in every step of the process beginning with the initial review of the seller's deed or Escritura. Passport and Entry Visas must be copied and notarized, to be submitted with the official property description to be purchased to Secretaria de Relaciones Exteriores for the permit to own property as a foreigner. Several documents must be gathered to do a title search. These include: the Certificado de Libertad de Gravamen which serves as proof of no liens; the Carta de Valor Catastral states the assessed value of the property as recorded by the Municipality; and the Carta de Catastro stating lot dimensions, location within or without the restricted zone and serves as proof that property taxes are paid and up to date. An official bank appraisal or Avaluo is the next most important document as every major fee and tax incurred in the title transfer for both the seller and the buyer will be based on this appraisal. A letter of instruction from the bank to the notary will be necessary, if you choose to hold the property in trust. In the event that either the buyer or the seller is unable to attend the closing or to be present during the acquisition process a power of attorney or Poder can be signed, limited to the specific transaction. If the power of attorney must be signed in the foreigner's country of residence, outside of Mexico, the power of attorney in order to be valid in Mexico, must be signed before a notary and then must be accompanied by an "Apostille" which can be secured from the Secretary of State Office - Department of Licensing. "Apostilles" are attached to notarized documents being sent to nations that have signed the 1961 Hague Convention Abolishing the Requirement of Legalization for Foreign Public Documents. Real estate transactions in Mexico are "closed" by a Notario Publico, an official, highly respected government appointed attorney, who acts as a neutral intermediary. Among other things, the notary is responsible for the title search as title companies are not commonly used in Mexico -- (Stewart Title International can be contracted to provide title searches and insurance for properties in Mexico.). The notary is further responsible for formalization of the final real estate transaction and the calculation and collection of the capital gains tax, which is a federal tax and usually a seller's expense. After signing the closing papers and the seller has received full payment, full rights of ownership and possession passes to the buyer. At this point, there are a couple of remaining steps which include the payment of the tax to the Tesoreria or the Municipal Treasury for the transfer of title or Traslado de Dominio. As of 1994, the transfer tax rate is 2.5% of the bank appraised value. The final step is recording the deed and title by paying the recording fees and submitting the Escritura to the Public Registry Office or the Registro Publico de la Propiedad. Property taxes, known as the Predial, are very low in Alamos and are based on the assessed value or Valor Catastral. The Predial is paid annually and due in the first quarter of each year. The transaction is complete, now you can use your copy of the Escritura to change the name on all the utility services. Welcome to Your New Home in Alamos!